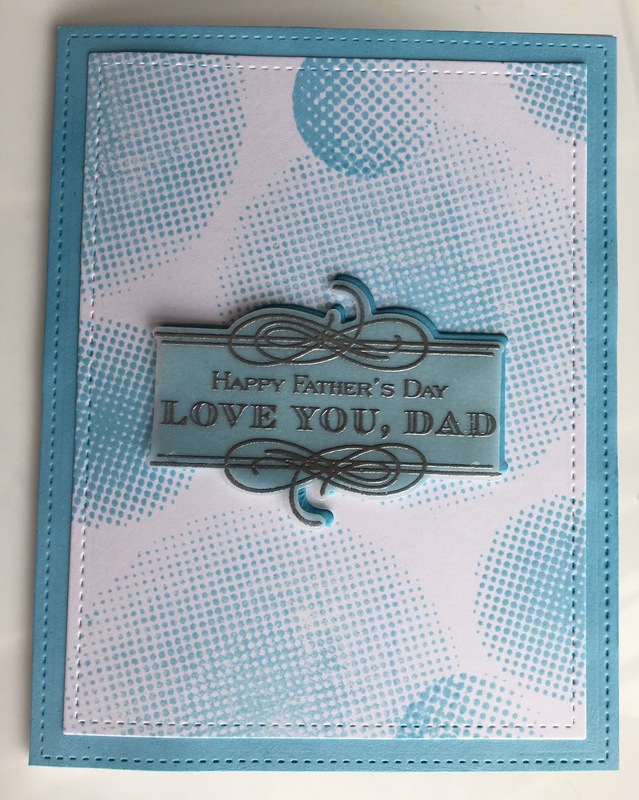 I'm playing along with the Muse Challenge #215 today and my take on Tracy McNeely's beautiful, clean and simple card was remembering the man in your life and I had made a Father's Day card for Dad McCaslin and it seemed to fit the bill. I wish I'd get a better handle on taking a picture of these cards, but I've been whining about this for awhile. Anyhoo, to create this A2 card, I chose Tumbled Glass from the distress inks and stamped some white cardstock with the Halftone Circle stamp set from Altenew. I picked various sizes and once that was done I realized I had no matching cardstock to do some layering, so I did a direct to paper method and smeared up an additional piece of cardstock with the blue ink and then I liked how it looked and decided to go with it and did an additional little piece to place the sentiment. I stamped the actual sentiment on vellum and embossed it with silver embossing powder. I die cut the rectangles with my usual 'go to' rectangle stitched panels. This is an elegant masculine card, perfect for Father's Day. As for making your own blue cardstock - well done! That's the best way to know that it matches! lol! Thanks so much for joining us at Muse this week! The Halftone Circles looks great in one colour and making your own cardstock is awesome! Thank you for sharing with us at Muse this week! Hi Mary, thank you for visiting my blog. Your card seems me very original I like the embossing vellum. I have also been watching your blog, you have a very special style, your works look like small watercolor paintings, I like it! Hugs from Palma de Mallorca Spain. Thank you, Loli- you made my day!